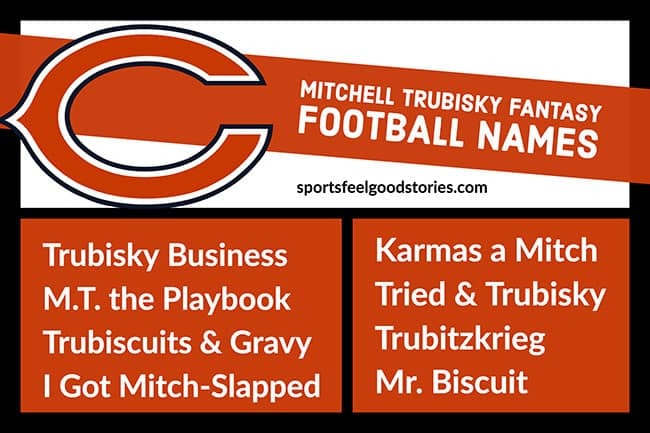 Our Mitchell Trubisky fantasy football names reflect the leadership, cool-as-a-cucumber approach, and fun-loving nature of the Chicago Bears QB. The Bears are among the NFL’s young and hungry teams, led by the exciting play of their franchise quarterback, Trubisky. The young quarterback’s play, and the new Monsters of the Midway led by Khalil Mack, has Chicago ready to shuffle once again. Trubisky was selected by the Chicago Bears with the second overall pick of the 2017 NFL Draft. His nickname is “Mr. Biscuit”—a play on his last name. He likes things clean, and reportedly vacuums three times a week at home. The mobile quarterback ran for 248 yards in his rookie year, the most by a Bears quarterback since Kordell Stewart in 2003. In game four of the 2018 season, Trubisky became the first Bears QB to throw 5 touchdowns in a half since Johnny Lujack did it in 1949. Trubisky played quarterback for the Mentor High School football team in Mentor, Ohio. He passed for 9,126 yards and 92 touchdowns while rushing for another 1,559 yards with 33 touchdowns. He earned the Ohio Mr. Football Award in 2012. Where did Mitchell Trubisky Play College Football? His college career spanned three seasons at the University of North Carolina at Chapel Hill. He completed his junior year with 3,748 passing yards with 30 touchdowns and six interceptions, earning him third-team All-ACC honors. Trubisky would forego his senior season at North Carolina, opting to turn pro for the 2017 season. Check out Bears’ Fantasy names for all players, coaches and more. You’re on Mitchell Trubisky Fantasy Football Names page.